LUCY BURDETTE: You know by now that I can't resist a debut author. I love hearing the stories about how they began a writing career, and what prompted specific books. Today, please meet our guest Marla Cooper, who will be giving away an advanced copy of her brand new, first ever mystery, TERROR IN TAFFETA. Welcome Marla! MARLA COOPER: It’s a question writers get asked a lot: "Where do you get your ideas?" Really, they can come from anywhere—an overheard conversation, a memory from the past, an interesting story in the news. But the idea for my series about a destination wedding planner came to me like a gift from the universe—one that came wrapped in pretty, metallic paper with an expertly tied bow on top. Several years ago, I got a call from an editor at Chronicle Books who wondered if I'd be interested in ghostwriting a nonfiction book. It seems they'd penned a deal with a destination wedding planner named Alison who was too busy planning fabulous destination weddings to actually write said book. Of course I said yes, and before long, I was meeting with Alison in her tastefully decorated office so that she could dump the entire contents of her brain into mine. As she told me all about her job, two thoughts occurred to me: 1) Alison might just be the luckiest person I'd ever met, and 2) her job was the perfect setup for a murder mystery. Here she was, flying off to foreign countries with people she barely knew, and if anything went wrong, everyone looked to her to fix things. Of course, she'd mostly dealt with situations like squabbling bridesmaids or having a string trio show up when they'd hired a quartet, but of course my imagination took it a step further. I was tempted to ask her what would happen if something really terrible happened. Like, oh, say, everyone hated one of the groomsmen and he ended up being murdered—you know, that kind of thing. But it was our first meeting and I didn't want her to think I was a terrible person. Besides, I knew what the answer was: She would investigate, of course! After all, she'd be the one in charge. Besides, wedding planners are typically super resourceful—not to mention really well organized—so if they couldn't get to the bottom of things, who could? Well, okay, sure, the police. But what if they wrongly suspected one of the wedding party? Alison and I went on to talk about more mundane matters, like site visits and tent rentals, but when I left, I had a tingly feeling way down deep in my spine. I didn't just have just one book to write. I had a whole series! Okay, readers, I was going to ask you where you get your ideas, but I'm in the mood to talk about weddings. Have you ever been to a destination wedding? Or have you ever been to a wedding where things went really wrong? One randomly-chosen commenter will win an Advance Reading Copy of TERROR IN TAFFETA, which comes out March 22 from Minotaur Books. MARLA COOPER was astonished when she realized people could actually get paid to write things. So she switched her major from business to advertising—much to the relief of her accounting professor—and began her career as an advertising copywriter. After moving to San Francisco, she became a freelancer so she could take advantage of perks like working in her pajamas, and it was while ghostwriting a book on destination weddings that she found inspiration for her first novel, Terror in Taffeta. 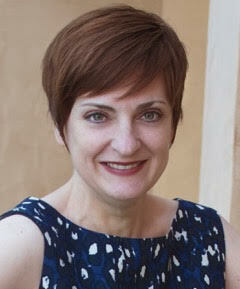 Originally hailing from Texas, Marla lives in Oakland, California, with her husband and her polydactyl tuxedo cat. Visit her at www.marla-cooper.com. 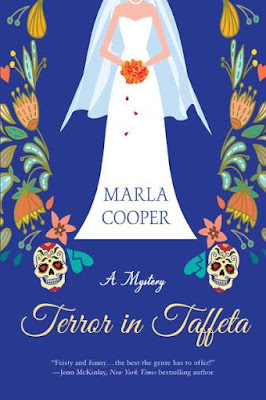 TERROR IN TAFFETA is the first book in a new series by Marla Cooper. It will be available in bookstores on March 22, but you can pre-order it now from Amazon, Barnes &Noble, and other fine retailers. Kelsey McKenna has planned out every detail of her client's destination wedding in San Miguel de Allende. But what she hadn't planned on was a bridesmaid dropping dead in the middle of the ceremony. When the bride's sister is arrested for murder, the mother of the bride demands that Kelsey fix the matter at once. And even though Kelsey is pretty sure investigating a murder isn't in her contract, crossing the well connected Mrs. Abernathy could be a career-killer. Before she can leave Mexico and get back to planning weddings, Kelsey will have to deal with stubborn detectives, late-night death threats—and guests who didn't even RSVP. Destination weddings sound so luxurious; alas, I have never been to one. Usually, the going-wrong things in our family seem to happen before the day of that walk down the aisle. One of the most frustrating was when our oldest daughter wanted to wear the headpiece I'd worn when her father and I were married. Sure, I was all for that, so pleased that she liked it enough to want to wear it herself . . . but we'd just moved; everything was in a state of mass confusion, and the box with the headpiece was nowhere to be found . . . .
Congratulations on your book; I'm definitely looking forward to reading "Terror in Taffeta" . . . . I love how you got the idea, Marla! And I agree it's a perfect setup. I've never been to a destination wedding, but my son was best man at one last fall - the couple, both Russian-Americans, rented a villa in Tuscany for the entire wedding party and guests. By all reports everyone had a great time, and it was easier for the European relatives and friends to get there. But I can totally see how things could go terribly wrong. Tell us the setting for the first book! Oops, sorry, didn't read the blurb. I love the idea of using San Miguel. And think of the research trips you get to make! Fascinating, Marla - and I have to say if I had to plan weddings I'd feel as if I got stuck in a horror novel. I did almost nothing for my own wedding which was 50 people in my parents' NY apartment. And my daughter did 99% of the planning for hers though we picked up the bill and saluted and marched to her very reasonable requests. I'm with Edith. The first thing I thought of was the tax deductible research trips. I've never been to a destination wedding, although if I were to do anything other than write at this point in my life, I'd be an event planner. The series sounds great, Marla. Take time to enjoy the experience of your first book hitting bookstore shelves! I have not ever been to a destination wedding, but my daughter has had friends who chose to get married on a beach or on a mountain. I think each of those turned out well. Love the sound of this series though. As some have said, lots of places to choose from. So far, the only "destination" wedding I've attended was my own in Las Vegas, 34 years ago this week. However, our niece is getting married in September, at a ranch in the middle of nowhere, and we will definitely go there. We were invited to another ranch wedding last summer, but couldn't go. The bride entered the corral near where they had the ceremony on horseback, with cowboy boots under her gown. She and the horse had the same flowers. The craziest wedding I ever attended was in Cleveland in the 70's. An Italian guy married an older Polish bride. The reception dinner was epic, with heaping bowls of Polish and Italian food passed down every table, and a polka band played later on. An old friend served as the wedding coordinator for her church for 20 years. She had some stories. I bet she'd love this book! I have never been to a destination wedding, although I agree with others that it would be fun. And the perfect setup for a mystery! The craziest wedding I went to was my best friend from high school. Because she was marrying a guy who is Romanian, they had to have two ceremonies. One in February in the Orthodox church. I wasn't at that one. But my friend really wanted to have an outdoor ceremony for the extended friends and family (I was maid of honor). So she rented a hilltop. The morning of the wedding was a horrific rainstorm. The owners of the land had to drive guests to the top in their 4-wheel drive truck and we laid planks so people wouldn't have to walk through the mud to get to the pavilion. My friend's dress was okay, but mine still wound up with mud an inch deep on the hemline. Thank goodness for baby wipes! I just received an ARC of this book in the mail yesterday. While I have strayed from my cozy reading of late, I have to say that the cover and premise immediately drew my attention - no small feat given the volume of books that arrive each day. I am hoping that I can find a way to squeeze this one into the blog's schedule. As for destination weddings, I have never been to one. It seems like they would add even more stress to a high-stress day, but if they come off well, I know it would be a blast. Way to spot an idea and latch on, Marla! What fun responses! I loved reading every one of your comments, and I have decided just now that I'm going to have to have a bride and groom on horseback because what could possibly go wrong?! Oh, and by the way, thank you so much to Roberta aka Lucy for having me! What fun. I feel like I'm at a party! Joan: Did you ever find the elusive headpiece? Edith and Laura: Research trips—Yes! My list of future destinations is suspiciously similar to the list of places I'd love to visit someday. Susan: Yeah, all that drama and tension, and the family dynamics—good material! Hallie: That sounds utterly amazing. One time I was at a hotel where they were setting up for an Indian wedding, and it looked like a movie set. I was checking out, but I was tempted to extend my stay just so I could see it. Now how do I get myself invited to one of those? Kay: An ice storm in central Texas?! That is unusual! That's one of those times you have to say, "Oh, yeah, didn't you know that it's good luck if there's an ice storm on your wedding day?" Mary: I had some friends who did the whole "two weddings in one day" deal. Mom wanted a big, fancy wedding she could invite all her friends to, but the couple wanted a Quaker wedding in a park. But the mud!! That's when a sense of humor comes in handy! Kristopher: Thank you so much for the kind words—and I hope you enjoy the book! I just checked out your blog. Very cool! I definitely want to read this, Marla. I've never been to a destination wedding (it wasn't a thing when my peers were getting hitched, and our children are just now getting old enough to consider matrimony) but I was ADDICTED to the "reality" show WEDDING ISLAND. I used to think the same thing - with all the travails about drunken uncles taking over the DJ's sound system and finding substitutes for 1,000 roses that didn't make the plane in time, it would be the perfect place to slip in a murder! My husband and I had a destination wedding on the island of Kauai 16 years ago. We were supposed to helicopter the wedding party to a remote waterfall and be married there. Of course it rained and rained and rained ALL day long and the helicopters wouldn't fly (thankfully!). We ended up hiking to a cliff overlooking the ocean and getting married early evening once the storm passed...after the wedding coordinator found a new minister since our scheduled one wasn't available. It definitely made for a memorable wedding! Congrats on your new book and thanks for the chance to win a copy! My husband's family is big on destination weddings. But it takes a big time and money commitment from the guests! I could imagine one getting very very grumpy. There are tons of weddings here in Key West--at the Hemingway House (must love cats--my friend Donna told me one story of the cats licking all the icing off the back of the cake during the ceremony), the Truman Little White HOuse, the Mallory Square pier, the beach, Sunset Key, right off Mallory Square. We go over there for lunch from time to time and often wedding flowers come with us on the boat...it's all great fun to watch! The only destination wedding I've attended is that of my daughter's, who got married on the beach in Key West. She was timing it for close to sunset, which shouldn't have been a problem, as we were actually going to drive (in a place where we rarely did) and we were but a hop and a skip from the location. But, alas, we hadn't factored in the Gay Pride Parade, which started a street from where we needed to turn in. We were stopped by the festivities of so many happy, dancing people that we didn't for a moment, well maybe a moment, dwell on our delay. Instead, we got out of our cars and danced along with the celebration. We did make it to the church/beach on time and had a beautiful ceremony and evening. Love the cover of your book and the premise of the series, Marla. Adding to my TBR list now. Julie: I'm with you; destination weddings came along after all my friends got married. I've never heard of Wedding Island, but I see that they have episodes online. I will definitely check it out! Kim: Darn that lush, verdant Kauai and its incessant raining. We were there two years ago and it's just gorgeous. I'm thinking about setting Book Three there! Lucy: I love the story about the cat and the wedding cake! And now I have a new goal in life, which is to attend a wedding at Hemingway House. Hubs and I had our own photography business years ago and shot a number of weddings -- never a destination wedding, unfortunately. But we did have an up close view of all kinds of wedding drama -- including a father of the bride who showed up late and drunk (he did manage to walk her down the aisle), and a bride who got bright pink nail polish on the front of her wedding dress just before the wedding (the maid of honor managed to pin it into a fold so it didn't show). Good times! Congrats on Terror in Taffeta -- looking forward to reading it! I have never been to a destination wedding - darn it -- I would love to go to one. I had a wonderful wedding planner who had been doing weddings probably before I was born and also did 3 of my sisters weddings. My wedding was wonderful, and even if something had gone wrong, she was ready for all contingencies She had what I called a magical Mary Poppins bag whose contents could probably have been used by MacGyver to get out of a helpless situation. She had a velvet glove too -- loved her! Marla, it's hard to imagine how it could have gotten lost in the first place considering that it's a cathedral-length veil about one hundred inches long . . . but disappointing my daughter wasn't in my plans so we spent a week or so digging through packing boxes searching for it. Ultimately, we discovered it carefully packed in its crush-proof box hiding inside a carton filled with linens. Well, shoot. Destination weddings were after my time. I've been to weddings held at the bride's home (mine and my best friend's), one held on a rented sailboat (no shoes on the deck),one outside in the boonies of southern Utah, and even a few in church! They all seemed to run smoothly, even without a wedding coordinator. It's only afterwards I'd hear about problems. At one of the church weddings the bride kept dipping and swaying to the side. Turned out the groom was standing on her veil and dynamite couldn't have moved him. My sister had hers on the aforementioned boat. The judge who was to marry her cancelled last minute. They found a justice of the peace who resembled a very rumpled Caesar Romero and made have had a few drinks for courage. But hey. They're still married. Your new series has so much promise. Who hasn't wanted to murder someone while preparing for a wedding? I was a bridesmaid for my boss, and she had spent a lot of time hiring a wedding singer. At the wedding, he rose to sing "The Lord's Player" and totally blanked out on the words. The mother of the bride had to prompt him. Needless to say, he disappeared quickly after the wedding, and I don't believe anyone saw him again. I wonder whether he got paid. It didn't ruin the wedding, of course, but it's not something you'd look back on fondly. I wish someone would invite me to a destination wedding! Your new book sounds intriguing--I wish you much success (and hope I win a copy). Oh, and looking forward to your book. I visited San Miguel with my parents, many years ago now, and would love to read about it. I have been to a destination wedding in a way. I had fixed up two of my friends, one British, one American. They fell in love and she packed up and moved to London to be with him. When they got married, they got married in Cambridge in the chapel at the groom's old college, Corpus Christi. It was probably one of the loveliest weddings I have ever participated in. And I finally got to be a bridesmaid! Well, while my daughter was in college, she worked temporarily in the New York office of the wedding gown department of a MAJOR designer. She told stories that I would not have believed if anyone else had told me. Bridzilla is NOT imaginary when it comes to designer wedding dresses. She was asked to become a permanent employee, and she said NO NO No! The only destination wedding I attended was in Reno, so we had a "mellow" attitude. I don't have a wedding disaster story to share—and hope I still won't after my younger daughter gets married in May!—but just wanted to say hi and I'm looking forward to reading Terror in Taffeta. Vickie: Wow, maybe I should volunteer to be a photographer's assistant. When we finally meet in person I want to hear all about the drunk dad! Celia: Your planner sounds great—especially with her magical Mary Poppins bag. I bet she'd be able to solve a murder case while getting a stain out of a wedding gown and finding a replacement minister for the one who cancelled! Joan: Now that's a train! Pat: Nice! The only thing that went wrong at my wedding was that the margarita machine didn't show up—and I didn't even realize until someone asked me about it. I love the rumpled Caesar Romero! Margie: Oh, no! I hope they're able to laugh about it now. Thanks for your kind words—and I agree, I wish someone would "make" me go somewhere fabulous to watch them get married. Deborah: The zipper story—wow! That's one of those times where having a wedding planner really pays off! I've seen designers sewing people into their dresses on Project Runway, but never heard of it happening in real life! Elizabeth: Ooooh, Cambridge. That would really be lovely. And I love that you played matchmaker successfully! I have yet to pull that off. 3 no 7: New York plus designer... oh, boy, I bet she saw some epically bad behavior! I'm almost giddy imagining the stories. Katherine: Hi, Katherine! Thanks for stopping by, and may your daughter's wedding be perfect and drama-free! I've been invited to a couple of destination weddings but didn't get to attend either. It sounds like such fun. The new series sound fun also. My husband and I had our destination wedding outside of Portland, OR--at a Depression-era poor farm that is now a winery (yay!). My daughter had the good sense to get married on Nantucket and one of the most beautiful weddings ever was that of mystery writer team Cleo Coyle in Las Vegas. As you can probably guess, I'm saving the date for every book in this series, Marla!!! Chris: Thanks, Chris! I had a lot of fun writing it! Lisa: I've been to that very McMenamin's! How neat that you got married there. It feels kind of haunted and would make a great location for a mystery! Funny you should mention destination weddings. Just last month, I went to a wedding where I hiked 3 miles and 2000 feet elevation gain one way to get to the wedding. The location was beautiful, however. I know that's not what most people think of as a destination wedding, but it's the closest I've been to one. My daughter got married in Cancun. I was the only one who got to go. The weddings around here are mostly family planned. I love the premise of this book. I'd love to read it. Luckily no crazy weddings here! But this books sounds great. Mark: That sounds ambitious—but fun! I'm dying to know where it is! jpetroroy: Thanks! I have to admit, I like a crazy wedding—as long as it's someone else's. I'm SO excited to read Terror in Taffeta! Congratulations! Great to hear a bit about the series origin. Did you ever write the nonfiction book? What a great idea for a series! I've never been to a destination wedding: when I got married in 1978 they hadn't been invented yet (! ), and none of my three sons are married (yet?). Perhaps there's one in our future?